Prologue explores emotional engagements in the realm of Virtual Reality. The project creates an immersive experience with story beats and progression of events to evoke emotional reactions from players using various methods including movement, mechanics, and visual and audio components. 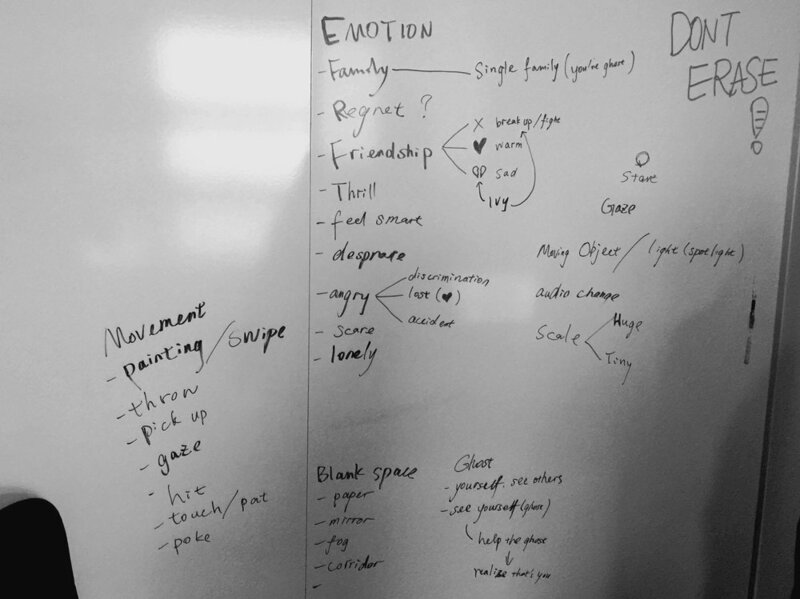 Our goal is to find a systematic way to evoke specific emotions in a story experience and to create and explore novel affordances for creating emotions for future VR developers. I led the design of PROLOGUE from initial research to final deliverable. I worked alongside a 3D Artist and two Software Engineers. What is the impact on moving the player on the experience of the story/emotion? What is the impact of allowing the player to move vs not allowing them to move on the experience of the story/emotion? What are different forms of representing movement in VR (swimming, flying, bouncing) and how do they relate to emotion and storytelling? Can you invent a new kind of movement for VR experiences? How can the audience can be permitted to move objects in the VR space in order to evoke specific emotions or storytelling beats? What actions create the desired feeling for your story? What kinds of player actions evoke specific emotions? How can combining actions create mechanics that express hybrid emotions? How can performing certain actions or mechanics in a particular order evoke specific emotions or story experiences? What can you do to direct the audience's attention to particular places without being heavy handed? What sorts of visual cues create mystery or drive the player to move or take certain actions? What visual or audio cues suggest that something is interactive and/or how to interact with it? How can gaze triggers be used to seamlessly create pacing and ensure that the audience doesn't miss a critical plot point? How fast or slow should a story progress (be paced) to allow the audience to absorb everything but not get bored? How can music be uniquely used to evoke specific emotions in VR? How does proximity or movement intersect with music or sound in VR? What visual effects can create certain emotional experiences or progressions uniquely in VR? How can the use of space, movement, and light intersect uniquely in VR to effect particular emotional progressions or story experiences? How can the shape of objects in the VR space be used to create specific emotions or story experiences? How can transitions between scenes be embellished with aesthetic elements that enhance the core emotion or story experience? I spent most of my time doing research in the first week of pre-production including materials of how to tell an emotionally engaging story as well as good storytelling short films and experiences. I was inspired a lot by one of the episodes in the 2nd season of Black Mirror called White Bear and some other similar concept short films. In the end we agreed on creating a looping story in which the start and the ending of the story will be somewhat the same but from a different perspective. Initially we had two different ideas for the story and the interactions as well. One is about reincarnation in which player would create a doll/robot and in the end becomes/"gives birth" to the thing he just created, the other one is more of a dark story where player does some "wrong" moves that he might not know at first and he needs to make a decision whether to set up another person or sacrifice himself (whether to become good or evil) in the end of the experience. Based on our initial idea, I created this emotional arc that we want players to experience. 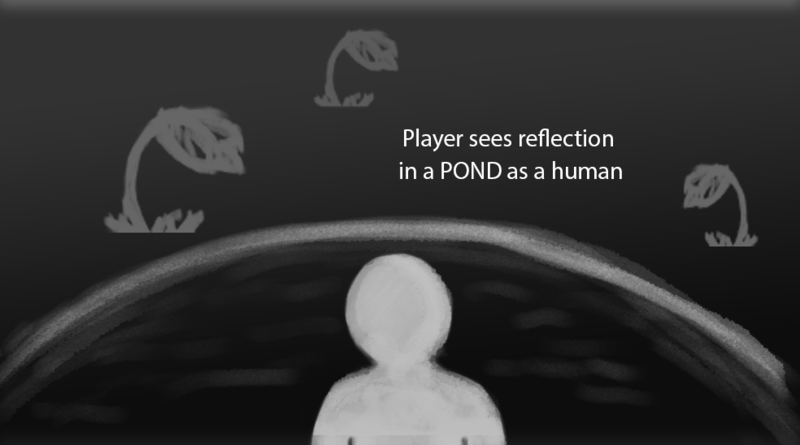 We want the player to feel curious at first and experience a set of positive emotions and then negative emotions. The twist will be a sudden transformation which includes scale and perspective change. And we want the player to have some takeaway/insights after the whole experience. In the first scene, Player will enter a foggy forest and see some fireflies from a far distance. And then player will notice a little creature crying in the forest. The creature will look at the player and look at the dead flowers on the ground back and forth asking for the flower. Once the player picks up the dead flower, it will become alive on player's hand. Two things that we learned from the iterations in this part is that 3D sound and feedbacks are essential in our experience so that we can indirectly control the player to go on for the main story line. 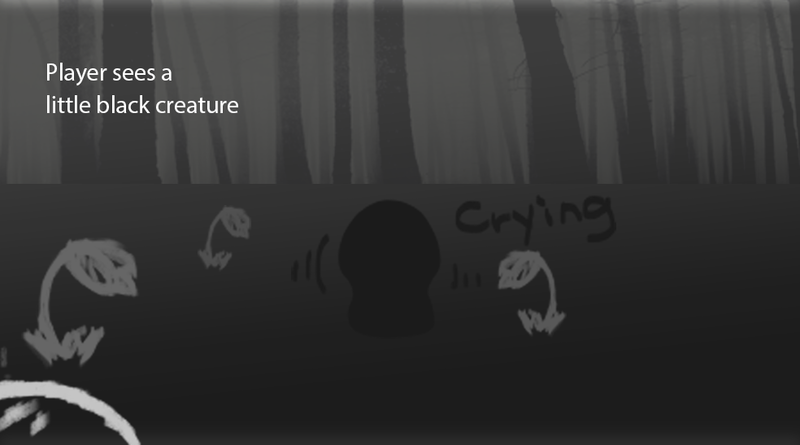 For example, player will hear directional crying sound from the creature in the beginning so that he knows where to find the sound source, the creature. In the early playtest sessions we got a lot of feedback saying that they want to interact with the creature but it is not responding to their actions. So based on the feedback, we added in some more animations to the creature to make it more responsive. Constant playtests are really essential for us since we need to test the effectiveness of conveying the story and evoking the emotions. So we created a playtest schedule for the whole semester. We planed to test transformation and the first half of the experience during our halves, test iterations from half on 11.4, complete our experience on 11.11, test the emotions through the experience on 11.17 and test the emotion towards the ending during our soft opening. After every playtest, we gathered feedback and learned what was good and what didn't work, based on which, we would iterate our experience. In the early playtest sessions we got a lot of feedback saying that they want to interact with the creature but it is not responding to their actions. So based on the feedback we got, we added in some more animations to the creature to make it more responsive. We tested our experience with 54 people in total. 49 out of 54 playtesters understood our general story. Most of the playtesters felt the transformation effective and impactful. The creature at beginning seems cute or neutral to most of our playtesters. About half of the playtesters didn’t feel scared, mostly from soft opening. And only a few had dilemma in the end, however, different ones as we expected. Two things that we learned from the iterations is that 3D sound and feedbacks are essential in our experience. For instance, in the final experience player will hear directional crying sound from the creature in the beginning and will hear scary sound from the monsters in the indicated direction as well. It’s important to perform thorough research during the first few weeks of preproduction. Our programmers researched the pipeline of using Unreal Engine and the designers went through lot of emotional engaging stories. This way, we were able to determine the limitations of our platform and work around them. We also identified the classic emotion arc of story and created our experience based on that. It’s not easy for players to have sympathy for a character in a short time. And it’s harder to make them choose between themselves and game character within a short period. In virtual experiences, players tend to think more about themselves. How to get them out and think about the game character needs a fair long time of relation building up. (story after prologue), which is what we want to convey through our experience.